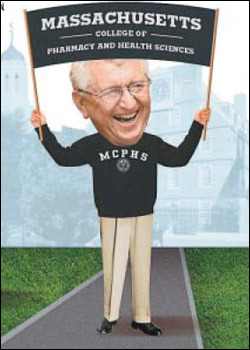 TRAINING Monahan, 68, graduated from the then Massachusetts College of Pharmacy in 1962 and started the Monahan Pharmacy chain of drugstores. In the presidents job since 1997, he sat on the colleges board for six years before that. CLAIM TO FAME Since becoming president of the school, which was founded in 1823 and is the oldest college in Boston, he has added two campuses (Manchester, New Hampshire, and Worcester). Hes helped the school to grow from 1,400 students in 1997 to 4,000 today and raised the endowment from $10 million to $100 million. Oh, and the schools graduates have a 95 percent placement rate out of college, and starting salaries top $100,000. BIGGEST CHALLENGE Completing his grand vision in the next four years, which is how long he has committed to stay on as president. He may or may not re-up. Also, lifting this excellent institution out of perpetual local obscurity.